Arthritis affects dogs as often as it affects people. A painful disease, it reduces your dog’s ability to move around and play. Older dogs often get osteoarthritis, a medical condition which gets worse with age. Though your veterinarian can prescribe pain medication for your dog, you can also choose some natural remedies to help your pet have an easier time with the disease. Combining natural treatments with home remedies usually works best, and dogs can still live a happy life. 1. Your dog should have a healthy weight. If you can’t tell whether or not your pet carries extra weight, just ask your veterinarian. Losing extra weight proves very important for taking pressure off joints, making them less prone to inflammation and less painful. If your pet weighs too much, help your dog lose the weight. The first thing you can do is reduce the meal portion sizes by 25%. Also, use higher quality food, as it has fewer carbohydrates and more vitamins and proteins, helping your dog lose weight and build stronger bones and muscles. You can even find low-calorie formulas available on the market for dogs. Discuss your options with your veterinarian and choose the best diet for your dog. 2. Glucosamine and chrondritin help repair damaged joints. Go to a pet store and look for supplements containing these nutraceuticals. You can also find glucosamine and chrondritin in some foods, but the quantity does not prove sufficient for therapeutic purposes. Your dog might also benefit from supplements containing methylsulfonylmethane or hyalauric acid. Your dog can take supplements containing all these nutrients or only some of them. Check with your veterinarian to see if the supplements will interact with your dog’s medication before starting a treatment. Joint supplements work gradually, and it will take several weeks before your dog will feel their effect. 3. Veterinarians sometimes use Adequan injections in cases when the dog suffers from more severe forms of arthritis. The injections contain a form of glucosamine and prove more effective and faster acting than the supplements. 4. Fish oil, a strong anti-inflammatory, remains popular among many arthritis patients who use fish oil supplements to treat their disease. The same works for dogs. You can use supplements available for human use for your dog. The dose should stay in line with the dog’s weight. Read the label and calculate the dose you should give your dog. 5. 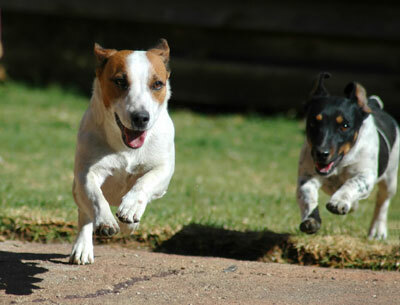 Encourage your dog to exercise and play with you or other dogs. Your dog should not stop moving, even if the joints prove a bit painful. Take your pet out for walks and look for a place where dogs can swim. Swimming is gentle on the joints and offers healthy exercise. 6. Massage your dog in the mornings, as it’s the time of day when arthritis pain feels the worst. Gently rub your dog’s joints and muscles for a few minutes to reduce stiffness accumulated overnight. Never massage inflamed joints, and stop the massage if your dog shows signs of pain. 7. Consider acupuncture for dogs. The veterinarian will insert thin needles in your dog’s body along acupuncture meridians. The technique stimulates circulation and proves very good for pain relief.